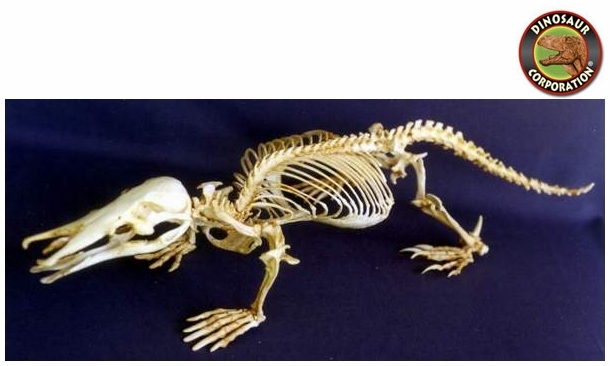 Platypus skeleton. Duck-Billed Skeleton. Ornithorynchus anatinus. Single living species. It is a Monotreme - an egg-laying mammal, a feature shared only with Echidnas. The Platypus (Ornithorhynchus anatinus) also known as the Duck-Billed Platypus is a semiaquatic egg-laying mammal endemic to eastern Australia, including Tasmania. Platypus weight varies considerably from 0.7 to 2.4 kg (1.5 to 5.3 lb), with males being larger than females; males average 50 cm (20 in) in total length, while females average 43 cm (17 in) with substantial variation in average size from one region to another, and this pattern does not seem to follow any particular climatic rule and may be due to other environmental factors, such as predation and human encroachment.